Digital advertising is a heavily jargon-based industry, and the simplest of concepts can end up sounding complex. Specifically, the rise of header bidding has intrigued many in the industry, but what exactly is header bidding and what effect will it have? 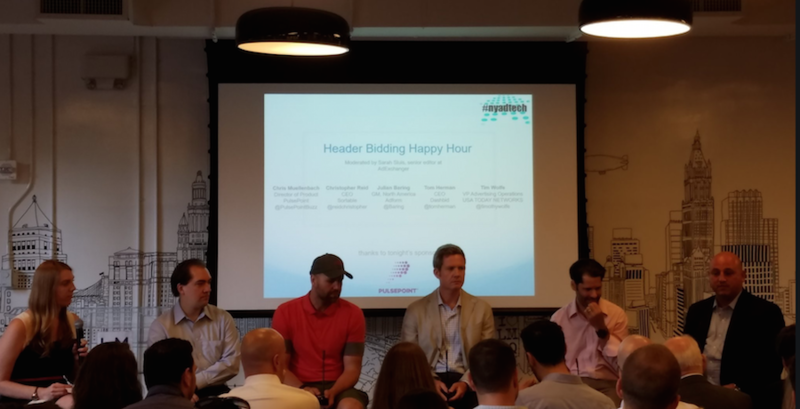 The NY AdTech Group sought to answer this by delving deeper into the growth of header bidding, standout of certain vendors and benefits that publishers take in at its recent meetup. The panelists included Chris Muellenbach, director of product at PulsePoint; Tom Herman, CEO at DashBid; Julian Baring, GM of North America at Adform; Tim Wolfe, VP of advertising operations at USA Today Networks and Christopher Reid, CEO at Sortable. Sarah Sluis, senior editor at AdExchanger and moderator of the panel, kicked it off with an ongoing thought: how do we even define header bidding? “I call header bidding the ability of publishers to take advantage of programmatic demand,” said Muellenbach. “You can give multiple demand sources the first look at an impression, unlike a waterfall. Giving everyone the first shot is a good thing for the demand side,” said Reid. The panelists went on to explain header bidding’s road to popularity within publishers, namely that it ensures the maximum profit. “[It] ensures, from a publisher’s perspective, that you’re maximizing yield. It also ensures that demand is competing on equal footing with all of the various demand sources, rather than Google taking precedence over the allocation,” said Baring. Herman added that Google used to be a prominent source for DashBid’s ad revenue, but it eventually decreased by 35 percent. The panelists also addressed questions and concerns publishers may have. When asked if there are any hiccups within header bidding, Reid noted that while publishers will see a lift in revenue, there are some caveats. Header bidding has many different components and publishers should take advantage of third-party software that collects data across entire audiences, said Herman. “It’s not as mature as other functions, so things can and will go wrong,” he said. Will header bidding make its way to video? Yes, and it actually already exists. Some feel there are increased costs with header bidding in videos, but overall publishers are happy, said Reid. Header bidding certainly benefits both the publisher side and the demand side of digital advertising. In this process, buyers are in an auction to claim inventory and the playing field is leveled fairly. The panelist representing the publishing side of the process, Wolfe, shared his concerns about header bidding. “I’m a little scared of it from the perspective of how many header bidders is too many to start latency. At what point do we start seeing people white label it and try to bring header bidding in house?” asked Wolfe. All the panelists expressed their views on the digital sensation, and Herman’s proved somewhat dismissive. He believes header bidding is a fad and will disappear from the conversation eventually. “It will push pressure on Google and, eventually, it’ll move back into the server. As a publisher, you need to be able to consolidate all of your data into one place,” said Herman. Throughout the event, panelists didn’t cease to throw Google under the bus for its unfair position in digital and poor marketplace behavior. Advertisers need to build their own data sets in order to not be “beholden” to Google’s, said Herman. The contention between Google and header-bidding-praising advertisers extends far beyond the panel doors, as Google announced in April its plans to test giving outside ad exchanges access to the Dynamic Allocation product.